As we assume office, it is our duty, and we will live up to it, to ensure we thoroughly review, document, and widely disseminate the present state of affairs so that all and sundry can know what has become of our commonwealth. 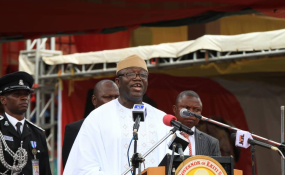 The Ekiti State Governor, Kayode Fayemi, has announced his first set of appointments. In a statement released on Tuesday evening, the governor named Abiodun Oyebanji as Secretary to the State Government (SSG). The governor also named Biodun Omoleye as Chief of Staff to the Governor, and Yinka Oyebode as Chief Press Secretary. Mr Oyebanji, a former university lecturer, had previously served as Chief of Staff during the administration of Niyi Adebayo, and was Commissioner for Budget and Economic Planning during Mr Fayemi's first term. Mr Omoleye, a former university administrator and former chairman of Ijero Local Government Area, had also served as special adviser in the governor's office. Mr Oyebode, a seasoned journalist, served as chief press secretary to the governor during Mr Fayemi's first term. He later served as special adviser on media to him when he was Minister of Mines and Steel Development.